We are so incredibly grateful for the time we had listening to God as we engaged teaching, practice, and group reflection together. On this page you will find resources available from our day. Our first resource is the individual and group reflection guide. 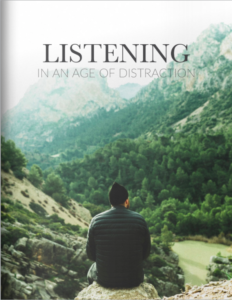 This guide will help us continue listening to God in the content from our time together. Because community is important for our formation in Christlikeness, we encourage you to engage this guide in community, with a small group, a spiritual friend, or a spiritual director. Second, you will find the teaching available below. Please forgive the audio quality, and due to some technical issues, we missed the first ten minutes of the opening talk. Before you listen to this teaching, please read Deuteronomy 6:4-9. Finally, a few people have asked for the worship setlist from the day. Below are the songs we sang together in worship.